The PC-3000 UDMA is a hardware-software solution intended for diagnosing and repairing HDDs based on SATA (Serial ATA) and ATA (IDE) interfaces for numerous vendors (Seagate, Western Digital, Fujitsu, Samsung, Maxtor, Quantum, IBM (HGST), HITACHI, TOSHIBA), for various capacities (from 500MB to 8 TB) and various form factors: 3.5" - desktop drives, 2.5" and 1.8" - laptop drives. 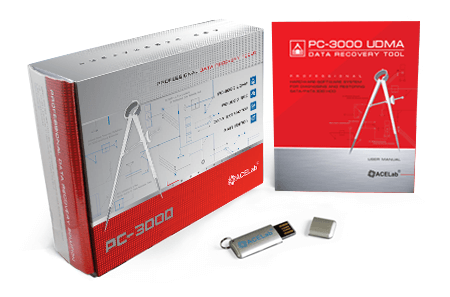 The PC-3000 UDMA coupled with the Data Extractor UDMA forms the PC-3000 UDMA Professional System that allows you to recover data from SATA, ATA (IDE) HDD. If you wish to repair these HDD, you need only the PC-3000 UDMA, and for data recovery you need the combination of PC-3000 UDMA and Data Extractor UDMA. 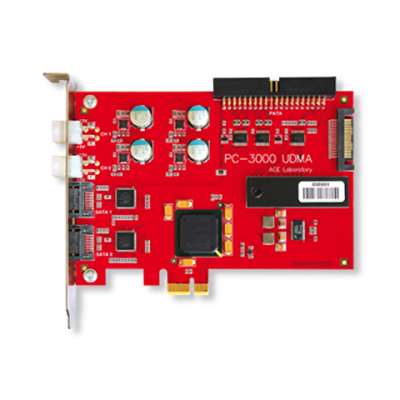 The new PC-3000 UDMA is a three-port tester-board which is inserted into a PCI-Express expansion slot and has 2 SATA ports (data transfer speed up to 133 MB/s) and 1 PATA (speed up to 100 MB/s) port. The primary port is SATA0 while SATA1 is a secondary port which is switchable with the PATA port. 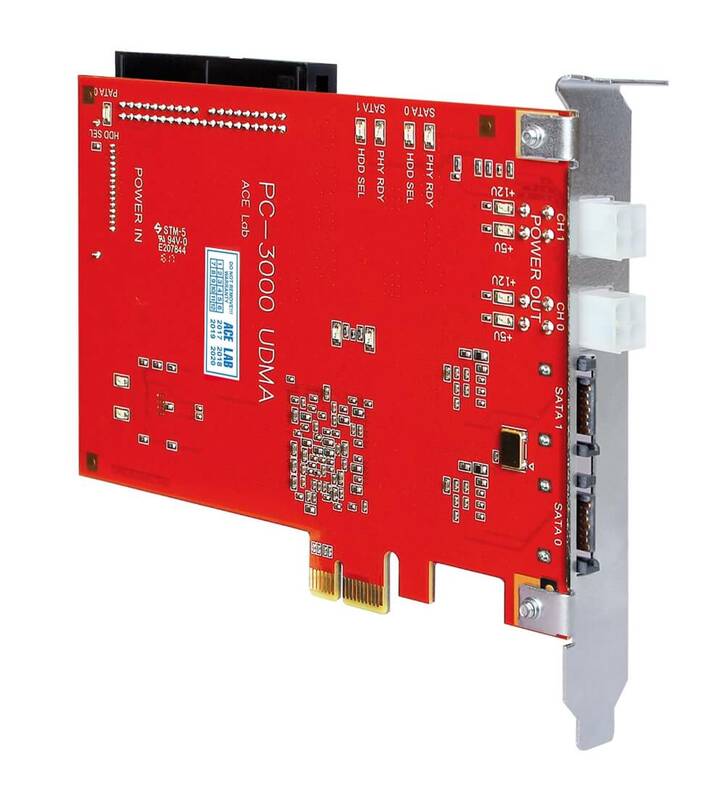 The PC-3000 UDMA provides two simultaneous connections for two drives – the first port is used for SATA and the second one can be used either for SATA or for PATA (it depends on your needs). 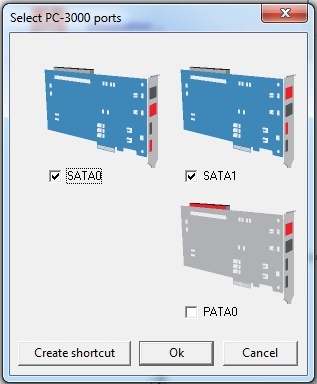 Thus, you can work either with 2 SATA drives or 1 SATA and 1 PATA at the same time. When developing the new PCI-Express-based PC-3000 UDMA system, we used the main features from the previous generation of PCI-based PC-3000 UDMA, which proved to be the best, most reliable, and most optimally performing data recovery system possible, while at the same time maintaining a reasonable price. Two ports are separable, but when they are both in use they are dependent. 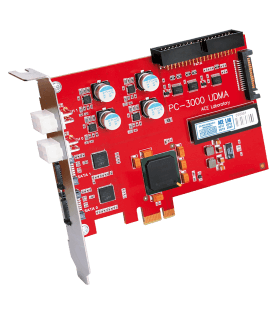 There is a slight reduction in performance on the second channel when the first one is fully loaded (no more than 20% reduction) as the PC-3000 UDMA is based on a single-channel PCI-Express bus. 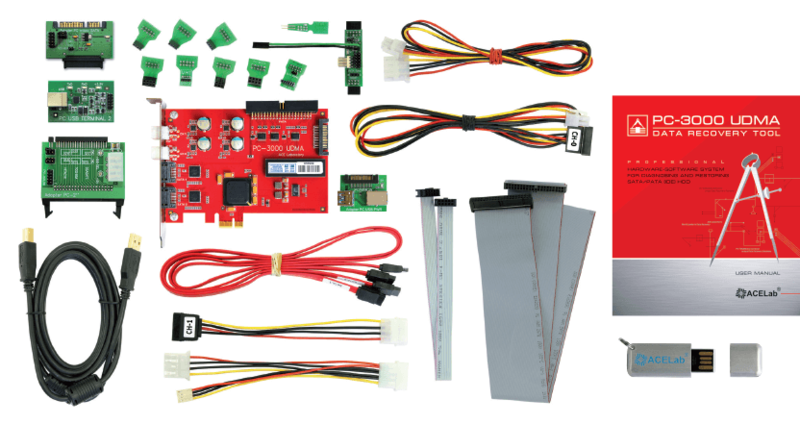 At the same time, this technical solution allows a reduction of the total cost of the board and makes it more attractive for small and mid-sized data recovery companies. According to the diagram, the reading speed of two channels on the new PC-3000 UDMA is much higher than the reading speed of the previous generation of PC-3000 UDMA on the PCI bus. A double-channel power supply adapter is located on the board controller and provides independent +5 V, +12 V voltage supply and protection from overvoltage and current overloading. In case of any contingency the HDD power supply is switched off automatically. 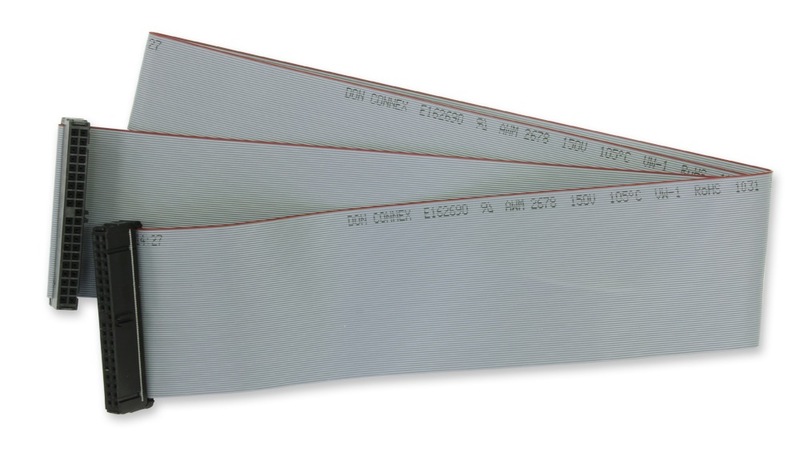 In addition, every channel has a feedback circuit with special management software that controls the supplying voltage values and informs the user about any issue with the feed circuit. One of the most important new features of the PC-3000 UDMA allows for launching of the PC-3000 utility and Data Extractor tasks as separate OS processes. The "PC-3000 Resource manager" software makes using the new PC-3000 UDMA very easy and effective. 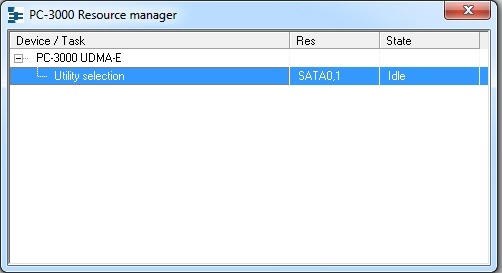 The "PC-3000 Resource manager" manages port and related process activity, controls the status of the ports, checks process conditions and kills processes when it is necessary. Once a process is started it can use more than one port. For instance, two processes can be used for every port or two ports can be used by one process. Form factor: Embedded board of PC expansion which uses one slot. 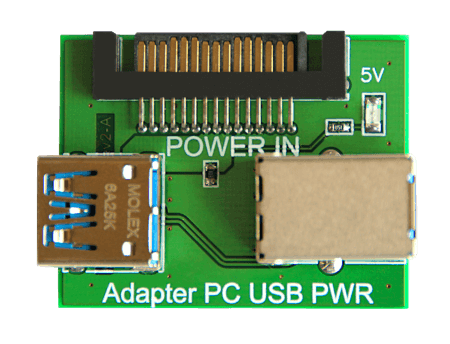 Power adapter: Two-channel power adapter with protection from overvoltage and current overloading. HDD Connectors are external. The PC-3000 UDMA includes 16 special utilities used for various vendors, architectures and HDD families. 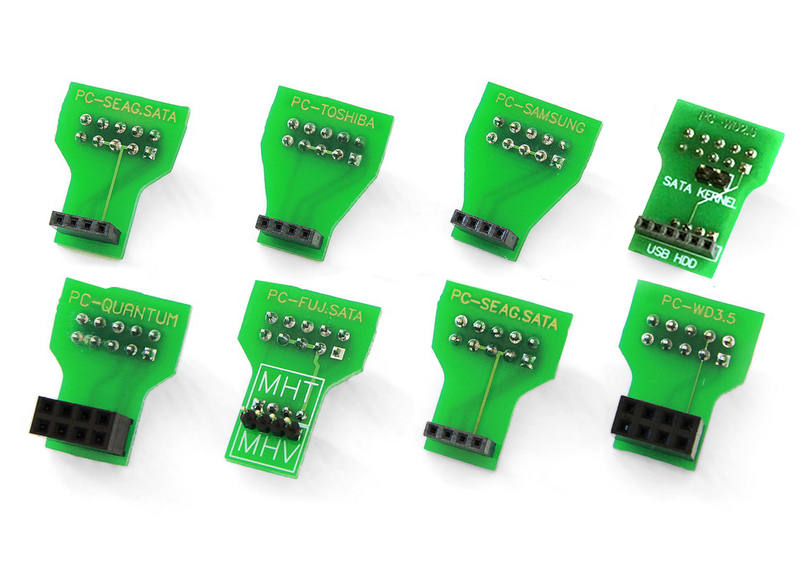 Special utilities help to conduct HDD diagnosis on a low level, reveal damages and try to exclude them using special program methods and gain access to user data. If you wish to only repair the HDD and you do not need user data, you can make full drive initialization, switch off damaged heads, hide defects on the magnetic surface and reconfigure the HDD. 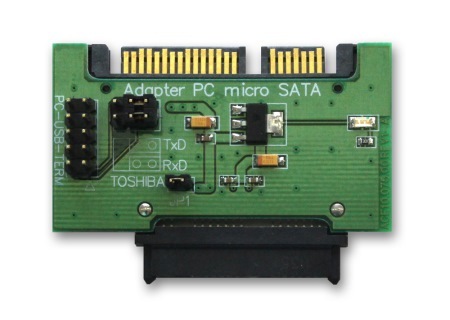 How to use the PC-3000 UDMA to repair HDDs? 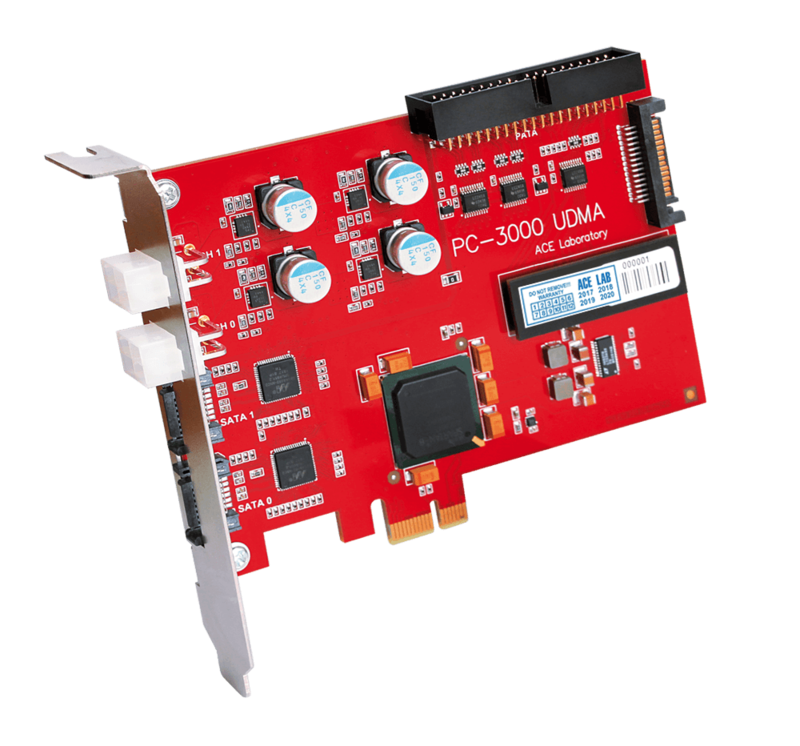 The PC-3000 UDMA Professional system has a massive database of factory firmware resources: FLASH ROMs, service area modules, service area tracks and other HDD critical resources. The database is systematized and stores all data in compressed format. 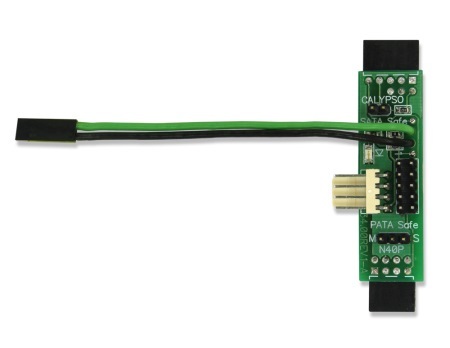 It allows getting quick and easy data access and sharing firmware resources between several PC-3000 Kits. 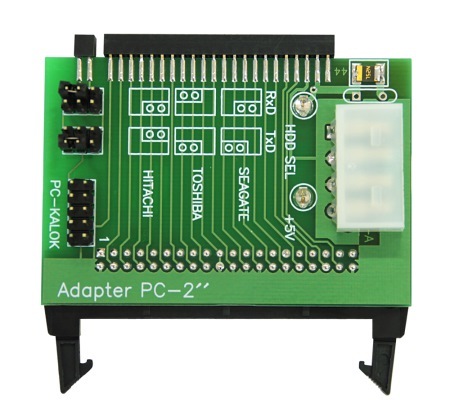 June 15, 2012 New version for PC-3000 UDMA Ver. 5.0.8 and Data Extractor Ver. 4.8 is released! 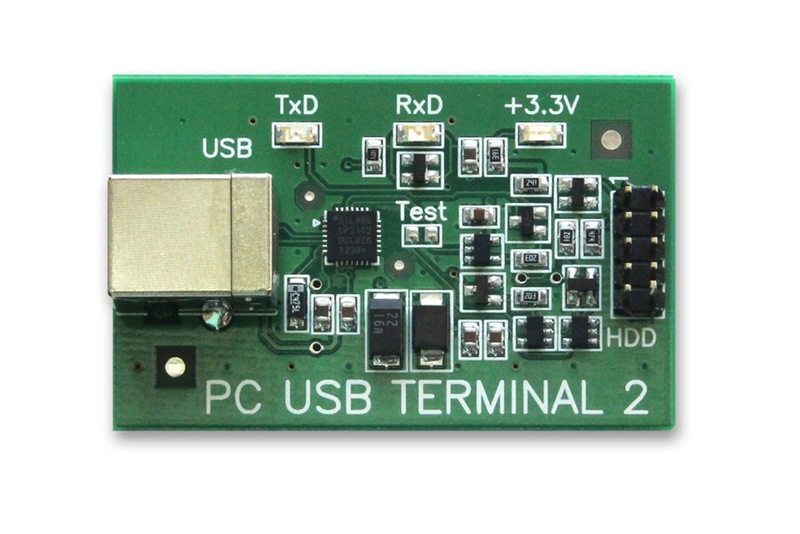 January 10, 2012 Update for PC-3000 UDMA Ver. 4.9.1 and Data Extractor Ver. 4.7.1 is released! January 19, 2011 New version 4.6.7 of PC-3000 for Windows UDMA with Data Extractor UDMA is released!